We design and build custom freestanding patio covers, gazebos, and pool cabanas. “Custom” means that we’ll design according to your preferences while one of our project developers gives you expert advice. Your project developer will provide you with a customized design that includes specifications, dimensions, and rendered views, and will see your project through from start to finish. We serve the Houston and Dallas – Fort Worth areas. If you have questions about freestanding covers, please call (281) 265-1994 in Houston or (972) 915-2727 in Dallas. Your freestanding patio cover will be the place to hang out. In Houston, Dallas, or Fort Worth your covered patio, gazebo or pool cabana will be your outdoor entertainment venue - a great place to send the kids to rest after a long day swimming or a place to invite friends over for a relaxing evening. You can customize your freestanding covered area by adding a fire feature and/or an outdoor kitchen. To make it a perfect space, you can even add an outdoor changing room or bathroom or an extra storage area. 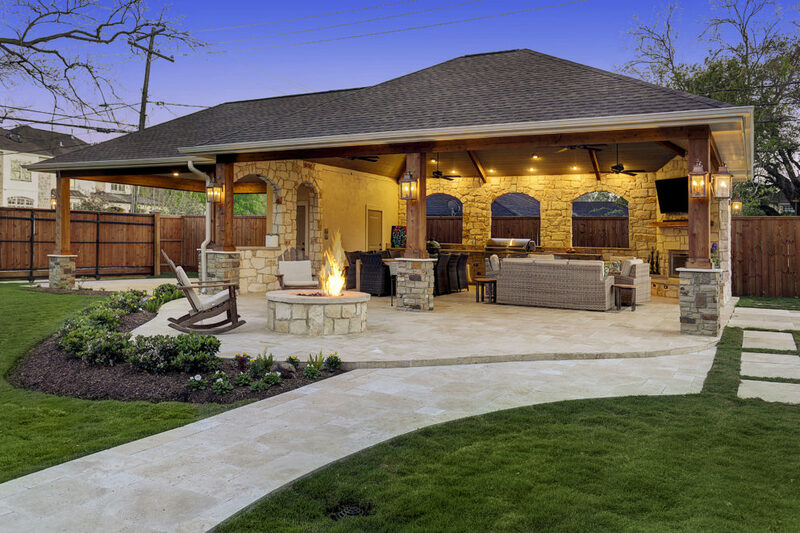 Your freestanding structure from Texas Custom Patios will be your favorite part of the backyard. A beautiful pool became even more enjoyable with the addition of this multi-purpose pool cabana. This handsome outdoor living room has a spectacular outdoor kitchen designed for a true meat-lover with a gas grill, smoker and warming drawers built in. This stucco pool house was designed to be a freestanding patio cover and to look original to the home. The homeowners desired a freestanding pool house that would be designed to complement the pool and the home. The unique shape of this project was dictated by the heavily wooded backyard in The Woodlands. The pool can be so much more enjoyable with an amenity like this pool house. Texas Custom Patios did an awesome job on our cover. I have enjoyed everything about it. The crew did a great job before, during, and after. I highly recommend them to everyone. Thank You for a beautiful patio.